Featuring the exceptional durability of solid steel and cast iron construction, the RIKON 30-120 13-Inch Drill Press offers the convenience of 16 spindle speeds and large cast iron handle for easy operation. Powerful and easy to use, the 30-120 has a 13-inch swing, and it is ideal for both the hobbyist and professional user. 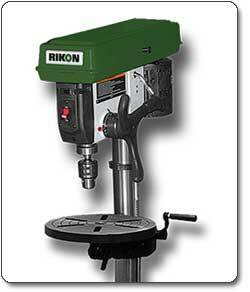 13-inch drill press has 16 spindle speeds and is made of solid steel and cast iron. 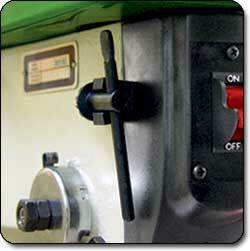 Replace bits and jigs fast with the easy-to-locate key and key-holder. Powerful, smooth, and efficient, the 30-120 owes its robust performance to a 1/2-horsepower motor that provides plenty of torque for whatever material you're drilling. 16 spindle speeds from 200 to 3,630 RPM lend versatility. A clutch depth stop lets you set the drill depth, making the 30-120 particularly helpful for projects requiring repeated drilling. Boasting rugged cast iron and solid steel construction for vibration-free operation, this drill press is built to last. Complete with a cast iron head, tilting table, and base, as well as comfortable solid cast iron handles that will not bend or loosen after repeated use, the 30-120 provides reliable performance job after job, making it an ideal addition to a variety of job sites and shops. Designed to be exceptionally easy to use, the 30-120 is packed with helpful features. The table height conveniently adjusts with rack and pinion gears, which means you can make quick adjustments with the simple turn of a handle. It also features a convenient slot design, which makes for fast, easy mounting of jigs, vises, and fixtures. For added convenience and to accommodate different material sizes, the 11-3/16-inch table also tilts 45 degrees right or left and rotates a full 360 degrees. The 30-120 has a height of 39 inches, depth of 24 inches, and weighs 121 pounds. It is backed by a two-year warranty. RIKON 30-120 13-Inch Drill Press with drill press head, arm, table support, table, column assembly, base, two loose hardware bags, chuck, owner's manual, and cast iron handle.